St. Louis Weekend Events for Thursday, January 18th through Sunday, January 21st, 2018 feature Chris Janson, The Killers, Alabama, St. Louis Ambush, Mardi Gras Family Winter Carnival, Paw Patrol Live, Wolpertinger 2018, Unveiled Bridal Show, St. Louis Blues, and more. Hot Country Nights: The 2nd week of this annual country music series features Chris Janson. Janson is a singer-songwriter who has written hits like “Truck Yeah” for Tim McGraw and songs for other artists including Joe Nichols, LoCash, and more. His hits include “Buy Me A Boat,” “Power of Positive Drinkin,” and “Holdin’ Her.” His latest album, Everybody, was released in September 2017. Its lead single is “Fix a Drink.” Featuring special local guest the Bobby Ford band as opening act! Tickets are $20 in advance/$30 day of. 6th Annual “An Evening with the Cardinals”: Join featured guests Whitey Herzog, Willie McGee and Keith Hernandez as they reminisce about the 1982 World Series and share other treasured stories about their time with the St. Louis Cardinals. Dan McLaughlin, voice of the Cardinals, will host the event and moderate a question-and-answer session with these baseball legends.The evening will also include silent & live auctions featuring one-of-a-kind memorabilia. A seated dinner will precede the program. “An Evening with the Cardinals” has become a celebrated event in St. Louis enabling fans to hear treasured stories from former Hall-of- Fame Cardinals while supporting children with cancer. Family Winter Carnival: A free, family-friendly event thrown in conjunction with some help from the community and St. Louis’ first responders. There’s something for everyone of all ages, with bounce houses, story time, fire trucks, police vehicles and lots of new furry friends to pet and feed. Local artists and musicians will provide interactive opportunities for the kids in attendance, and the whole family can pick out festive crowns, masquerade masks and face paint to get into the Mardi Gras spirit! St. Louis Blues: The Blues take on the Arizona Coyotes Saturday night at home. Tickets start at $69, check the website for possible discounts and promotions. 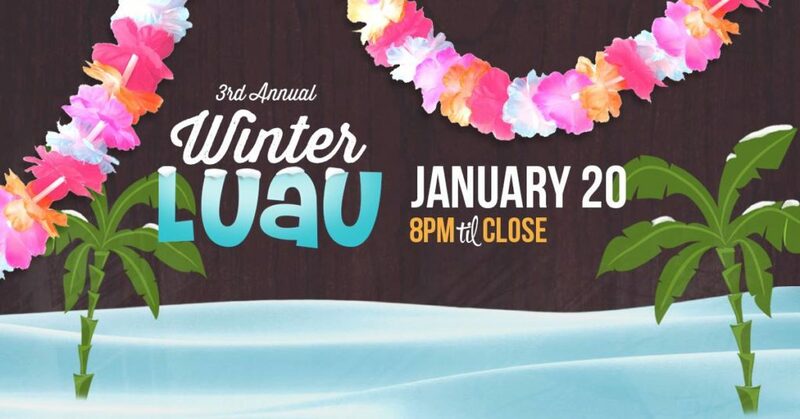 3rd Annual Winter Luau: The Crown Room’s 3rd Annual Winter Luau returns Saturday, January 20th! 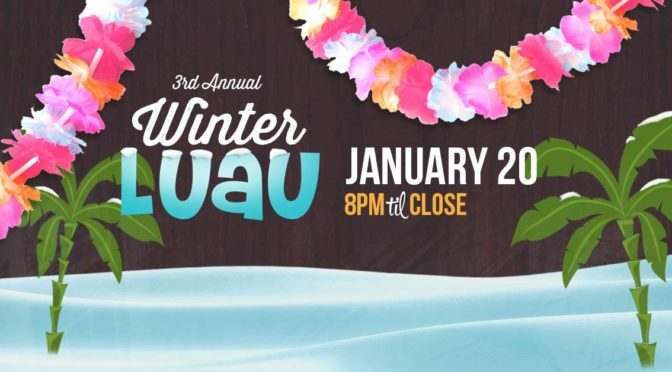 Join Budweiser Brew House inside Ballpark Village for the biggest Winter Luau party in all of St. Louis! Arrive early to get lei’d, enter into our midnight limbo contest, and receive FREE luau themed swag! Enjoy drink specials like $3 Bud Light drafts and $5 Blue Hawaiians from 8pm to 11pm along with shot specials all night long! Paw Patrol Live! The Great Pirate Adventure: X barks the spot in the new tour PAW Patrol Live! “The Great Pirate Adventure”! It’s Pirate Day in Adventure Bay, and Mayor Goodway is getting ready for a big celebration! But first, Ryder and his team of pirate pups must rescue Cap’n Turbot from a mysterious cavern. When they do, they also discover a secret pirate treasure map! The PAW Patrol set out over land and sea to find the treasure for Mayor Goodway’s celebration before Mayor Humdinger finds it first! The pups will need all paws on deck for this pirate adventure, including some help from the newest pup…Tracker! Peabody Opera House is partnering with Fighting for Autism to host an Autism Friendly Performance with Paw Patrol Live! on Sunday, January 21 at 2pm. This show will include a sensory room available throughout the performance for families to take their little pups should they need a break from the show. Families can continue to watch the performance in the sensory room while participating in autism-friendly activities. Unveiled: The Bridal Event: Presented by St. Louis Magazine, Unveiled: The Bridal Event allows guests to preview offerings from the region’s top florists, caterers, photographers, entertainment specialists, production companies, venues, hair & makeup artists, bridal boutiques, and more. Check out over 50 vendors, a glamorous bridal fashion show, enjoy champagne cocktails and light bites, and win fabulous prizes. School of Rock: The Musical: Based on the hit film, this hilarious new musical follows Dewey Finn, a wannabe rock star posing as a substitute teacher who turns a class of straight-A students into a guitar-shredding, bass-slapping, mind-blowing rock band. This high-octane smash features 14 new songs from Andrew Lloyd Webber, all the original songs from the movie and musical theater’s first-ever kids rock band playing their instruments live on stage. Dance For Food St. Louis: Dance for Food is a series of professional, high-quality dance performances where the price of admission is non-perishable food items. Be entertained and help end hunger in partnership with Operation Food Search. Dance companies at January 18th’s show include: MADCO Professional Company, Ashleyliane Dance Company, Dance Concert Society of Kirkwood, and Tour DanceGrand Center Arts Academy. Jim Norton: Kneeling Room Only Tour: American comedian, radio personality, bestselling author and actor, Jim Norton is the co-host of The Opie with Jim Norton Show on Sirius XM Radio and currently has 3 one-hour comedy specials available on Hulu. He has regularly guest-starred on The Tonight Show, The Late Show with David Letterman, Louie, and Inside Amy Schumer. Tickets are $32. The Killers: American rock band formed in 2001, The Killers have been nominated for seven Grammy Awards, seven BRIT Awards, and twenty-four NME Awards. The Killers have won four NME Awards for “Best International Band” in 2005, 2008, 2009, and 2013. The band has won a BRIT Award for “Best International Band” in 2006 as well as a MTV Europe Music Award for “Best Rock Group” in 2006. Also in 2006, the band won for “Best Video” for “When You Were Young” at the Q Awards. Hits include: “Mr. Brightside,” “Human,” “When You Were Young,” “Bones,” “All These Things That I’ve Done,” and more. They are on tour now promoting their 5th studio album, Wonderful Wonderful. Tickets start at $49. All-Stars of Hip Hop: Check out legnedary rapper, DMX, along with E-40 and Scarface, one of hip-hop’s pioneer feminists, MC Lyte, hip hop duo, Young Bloodz, St. Louis’ own St. Lunatics – Murphy Lee & Kyjuan, and Tela at Chafeitz. Tickets start at $43. Wolpertinger 2018: UCBC’s annual, anniversary beer festival celebrating the spirit & community of Saint Louis’ craft brewers. This year’s festival features: UCBC special releases, including our anniversary brew, Wolpertinger 2018, a special guest brewery: La Cumbre Brewing Co. from Albuquerque, New Mexico, beer from 35+ local breweries, live music and some German & Non-German fare from UCBC. We’ll also be showcasing some special beers at The U.R.B. this year leading up to the fest. Tickets are $40. Comedy Night ft David Graham: Graham is a Hazelwood resident who earns his living by making people laugh. He is a full-time comedian who tours the country for about 30 weeks a year. Registered as the #1 clean comedian in America, he has opened for Chris Rock and Adam Sandler, both of whom sought Graham out because he works “clean” without any profanity. He will bring side splitting comedy including his “Forrest Gump of East St. Louis”. Graham will be joined by Chris Smith, from the Blue Collar Comedy Tour, and Mike Marvell. Tickets are $20. Alabama: Southern Drawl Tour: Legendary country music band with 21 straight #1 singles, a record that will probably never be equaled in any genre, 73 million albums, Country Music Hall of Fame and Hollywood Walk of Fame induction, two Grammys, the Minnie Pearl Humanitarian award, Entertainer of the Year awards three times from the CMA and five times from the ACM, as well as the latter’s Artist of the Decade award, 21 Gold ®, Platinum ®, and Multi-Platinum ® albums, and RIAA’s Country Group of the Century Award. Their hits include: “Dixieland Delight,” “Song of the South,” “Tennessee River,” “Take Me Down,” “High Cotton,” “I’m in A Hurry,” “Dancin’, Shaggin’ on the Boulevard,” and many more. Tickets start at $39.50. St. Louis Ambush vs Syracuse Silver Knights: Cheer on St. Louis’ indoor soccer league this Sunday for Kick Out Cancer night. There will be a 50/50 raffle and a game worn jersey raffle. There will be a pre-game clinic from 10am-12pm. Participants receive a bag, ticket to the game that afternoon, ticket voucher for a future game, and an t-shirt! Join them on Friday, January 19th, for the annual Mascot Mania Night. Kickoff is 7:35pm at Family Arena with the Mascot Game at Halftime. More than 20 local Mascots will be participating.